Where Can I Buy Vintage Bags Online? What's so special about vintage bags? Well, they are iconic, eco-friendly and stand the test of time. Everyone loves them. But we all know that finding an amazing vintage bag online is kind of like digging for treasure. These days, vintage bags are everywhere! On the arms of every top model, on your Instagram feed and most probably on your mother's closet. Vintage bags are not always cheap, that's why we combined for you a number of websites where we think you should head to if you want to upgrade your closet on a new vintage bag. AMPOUR The company was launched only in 2019. They sell casual, sustainable and vintage clothing and accessories. Their collection of vintage bags is impressive and at an affordable price. Currently, they have 10% off on every single bag. 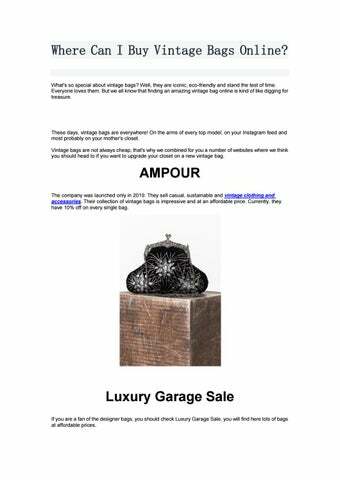 Luxury Garage Sale If you are a fan of the designer bags, you should check Luxury Garage Sale, you will find here lots of bags at affordable prices. What Goes Around Comes Around It's vintage streetwear brand with a cool name. You can find here a lot of vintage clothes and accessories. Originally from New York, the brand has a stall in Camden Market. The RealReal You will find here a lot of treasure. If you are price - conscious this website may not be for you. It's worth to take a look if you are after truly vintage bags.